The oil atomizer mod. 96.200 is suitable for the lubrication of mechanical components (bearings or gears) enclosed in a box and consequently isolated. Typical applications are in multiple drilling and tapping heads. The equipment consist of a 0.18 KW electric motor, a blade compressor and an electric flow control, and can be efficiently used in replacement of the traditional centralized lubricating systems. The oil mist is generated by a buit-in sprayer and is directly injected into the box to be lubricated, from where the air required for the compressor is drawn thus preventing any overpressure wich could damage the seal gaskets on the revolving shafts. motor stop; break of motor-compressor joint; compressor seizure; lack of air; lack of oil; disconnected tubes or loosened unions; clogging of oil tubes, air tubes, intake and inside filter. Maximum volume of the box to be lubricated : abt. 250 dm3. Maximum suction height : 1/2 mt. 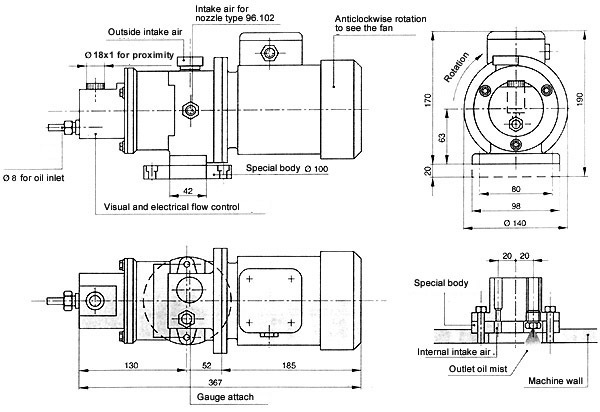 Oil viscosity : 3° to 5° E at 50° C.
Motor power : 0,18 KW. B) The unit can be mounted in whatever position, provided that the axis is always horizontal. Adjust the fluxostat so that the arrow stamped on the same is always pointing vertically downwards. C) Use the maximum care when mounting the pipes. Check that the suction pipe, wich must have an internal diameter not lower than 6 mm, is perfectly lean inside ( if necessary, blow compressed air through it) and free from burrs at the end. D) The sense of rotation of the motor must be anti-clockwise, when looking at the rear cooling fan. E) When starting a new motor for the first time, it is a good rule lubrifying the rotor from the upper breather connection, using one of the two cc of oil. When the unit will have been running for a few minutes, it will be automatically lubrified for the subsequent starts. F) The unit is supplied after having been factory tested . Any inconvenience is denounced by the electric fluxostat, as explained under "technical Features"
G) The magnetic inlet filter and the magnetic cap on the unit shoul be replaced every 3,000 hours of operation. H) Any hollow space inside the box to be lubrified shoul be fitted with holes in diameter not lower than 50 mm, for the purpose of facilitating the circulation of the oil mist and the acces between one chamber and the other one. 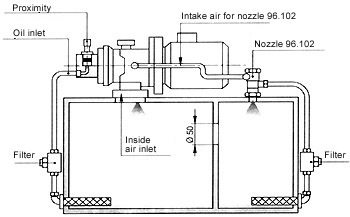 When the nebulization is to be made in chamber separated from the main room, it is necessary to have available an additional nozzle type 96.102 fed with oil drawn by means of an independent piping direct from the botton of the box or from the main suction pipe, togheter with air drawn from the nebulizer. With this unit, furthermore, it is possible to develop other special solutions. In this evenience, it would be advisable contacting us in view of designing the system with all the supplementary material required for the specific purpose concerned, and for the regular operation of the equipment.